Do you own a dog? Or looking at getting one? Then your want to know what are the best dog products around! 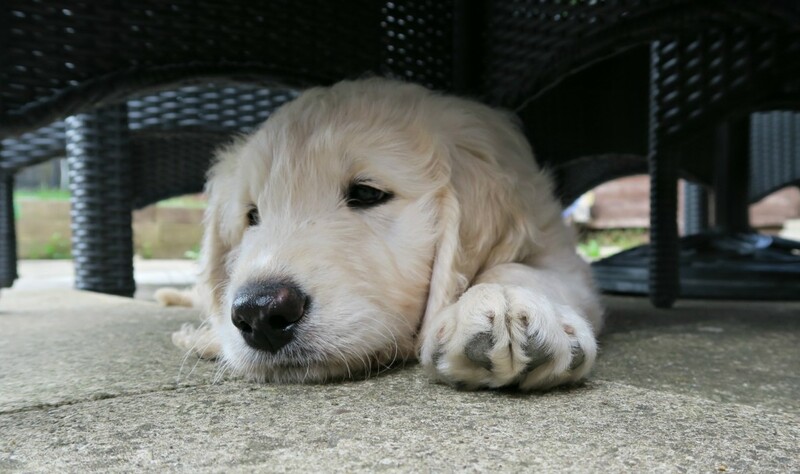 I have had a dog in the house for around 5 years now since our cute little Rusty the Hearing Dog came into our lives! All three have now gone onto their new homes to help them with their deaf recipients, job done! 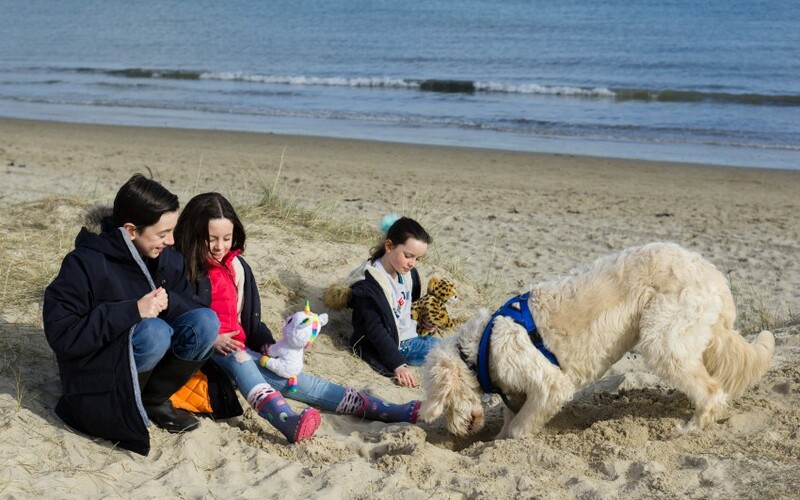 If you want to find out more about Hearing Dogs then please check out their website. We now have Gus the Goldendoodle who is ours! So I have gone through my fair share of puppy training, worked out what treats work well, what beds they love and what toys can survive their destruction! 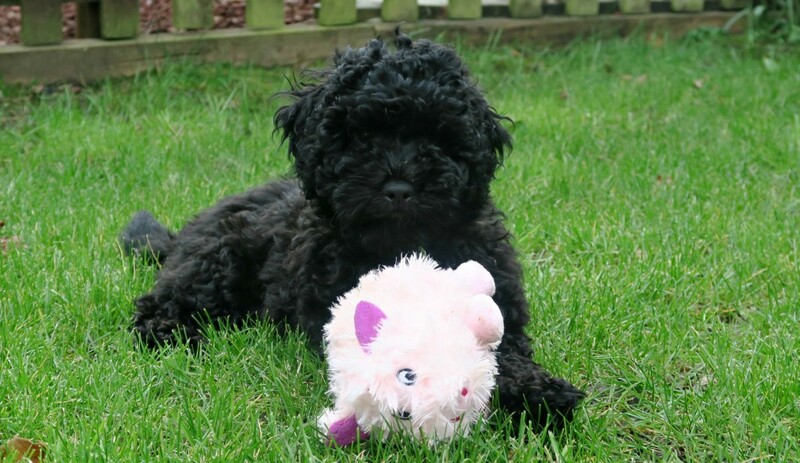 So as its National Pet Month I thought I would share my best dog products and what we love. Items marked with a * are products we have been sent but I am only sharing products that I love and use myself (well for Gus!) Post has affiliate links in which earn me a small amount of commission for referring you , however you do not pay any extra for this. OK this is Gus’s favourite and most important thing in his life! I would love to say it’s me but I am sure if he was presented with me or a bowl of food I think I know which one he would choose!!! When your dog arrives, either an older dog or puppy you should keep them on the food they are already on. If you plan on changing it that is fine but do your research first into what food you want them on. There are so many options but I found the website All About Dog Food fantastic. It details all the ingredients and how good they are for you dog. Don’t be fooled into thinking the big brand dog foods are the best, they may not! We picked Eden dog food, it is rated one of the best ones on this website for having 80% meat content and 20% veg and herbs. It is more expensive however you don’t need as much of it due to its high quality. Gus has done so well on this, his poo is soft but formed and he has not tummy troubles on it. I am very pleased with it. I have tried SO many dog treats for my dogs, food is such a great positive reward for dogs. Gus is very food motivated and if he thinks he’s going to get a little treat then he will come running back from anything!!! 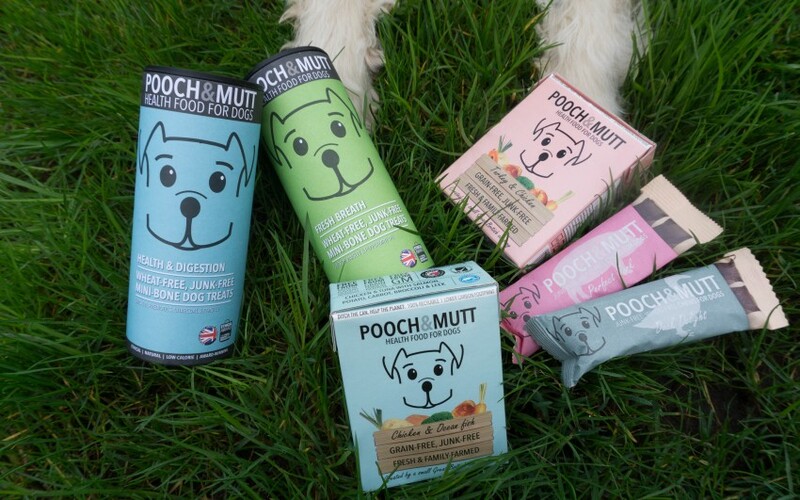 *Pooch and Mutt is a good brand of dog treats which Gus approves of very much! They come in natural, wheat free, junk free treats which I know will be kind on Gus’s tummy. 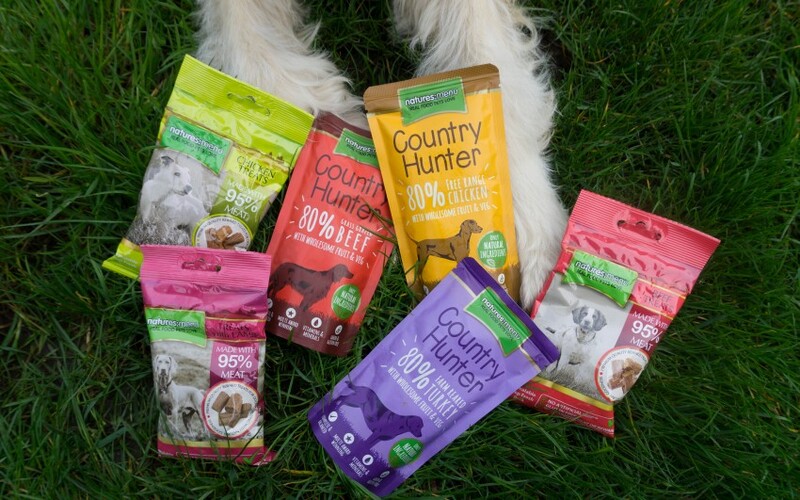 In the summer they are releasing a new range of wet food which are free from grain, cereal and gluten, they contain no artificial colours or flavours and are formulated free from GM produce. They are also the first wet pet food to come in a handy tetra packaging! We also have been trying out *Natures Menu treats for Gus too which comes in little packets for training treats. These size treats are perfect for training as you end up reward so often you don’t want to offer them huge treats each time. They also have a good reputation for supplying raw food for your dog too. When your training your dog you really need quick access to your treats. So purchase a good treat pouch to take out on all your walks with you. Fill it up with some tasty treats, and some really high value treats for really good behaviour. I have been using a treat pouch with a snap opening, this means you can quickly open and close it before the dog has lost interest or forgotten what he has done wrong! It’s good to teach dogs to settle and keep themselves busy without you. 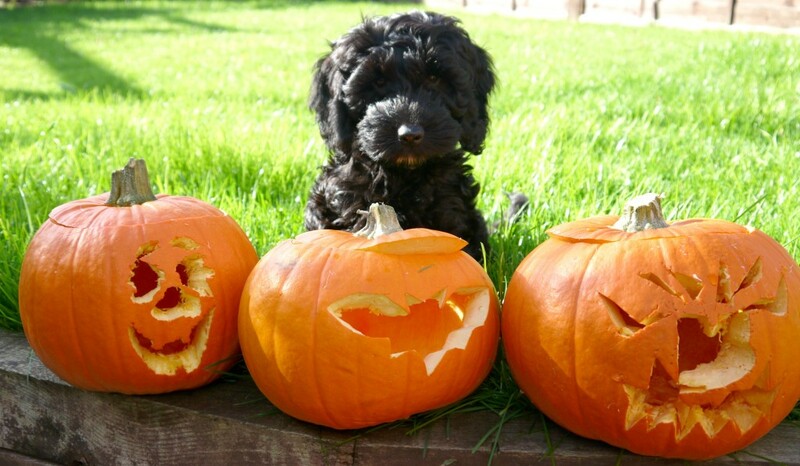 By offering treat puzzle games that they need to work out how to get the treat out from keeps them very busy! But I have found these can get damaged quite easily. So you could invest in a *Kong, they come in all sorts of shapes and sizes and can be filled with so much. 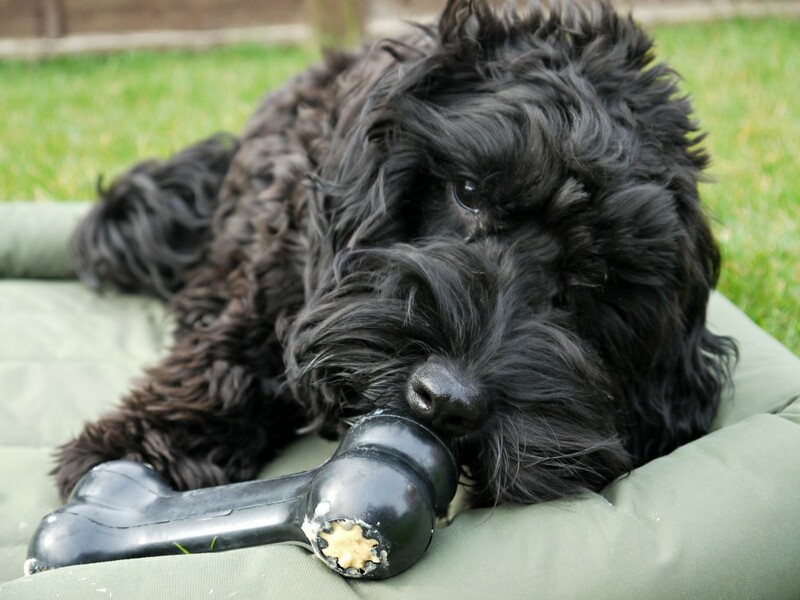 Have a look at the blog post I wrote with 39 ideas on what you could fill a Kong with! I have gone through a few dog bowls over the years, finding ones that work well and then when we got Gus he needed a huge bowl for his water as I couldn’t keep up with him! But it needed to be a sturdy bowl and we found this one at Pets At Home with a rubber bottom. We’ve had it a good year now and no problems at all. We also found as he loves food so much that he would eat SO fast, we wondered does he even realise that he has had his dinner!! So purchased a slow feeder for him, it has made such a difference to his feeding time. Hasn’t stopped him being greedy though! Oh have we gone through dog toys! Some dogs are pretty destructive when it comes to dog toys so go on what your dog is like, but mine has pretty strong teeth and can destroy any soft toys pretty quickly! Also anything that is food or dog chew they don’t last long. So we have Antlers, I always buy a really big one and yes they are about £20-25 depending on what size you go for but they are worth it. It lasts him months and months, and is always picking it up to chew on. Tennis balls! I can’t go on a walk without a tennis ball! Gus loves to interact with me on a walk, which is perfect for recall and out walking together. He could easily run off with other dogs and play, but if I have taught him it’s fun to play games on a walk with me, then he will be more inclined to stay with me. I don’t even bother with the cheap ones for dogs anymore though as they just split when Gus holds them in his mouth, and now buy the proper sports ones which you can get from places like Sports Direct. He also loves hiding them in the sand and rolling them down hills! He also loves a *chuckit stick as that allows him to run further and not have to put up with my rubbish throwing skills! These brand of tennis balls also are very good and last. Gus is a big dog and has some strength behind him. I have recently purchased him a Julius K9 dog harness and it has been very successful. 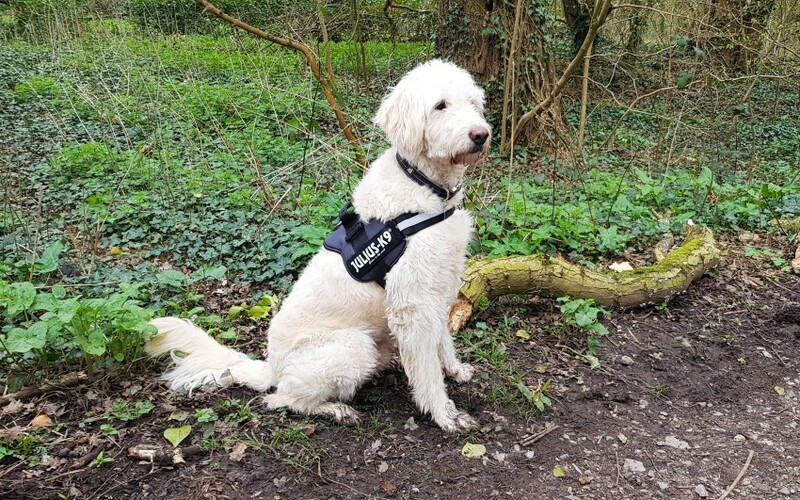 I understand when I am on a walk that some people may find Gus too big, so I usually call him back, and with this harness I can now grab hold of the handy handle on the top of it! It is comfy for him to wear, doesn’t slip and he doesn’t pull very much in it either. Another huge range of options out there! I wanted something that was quick drying, with two clip ends and options on length. 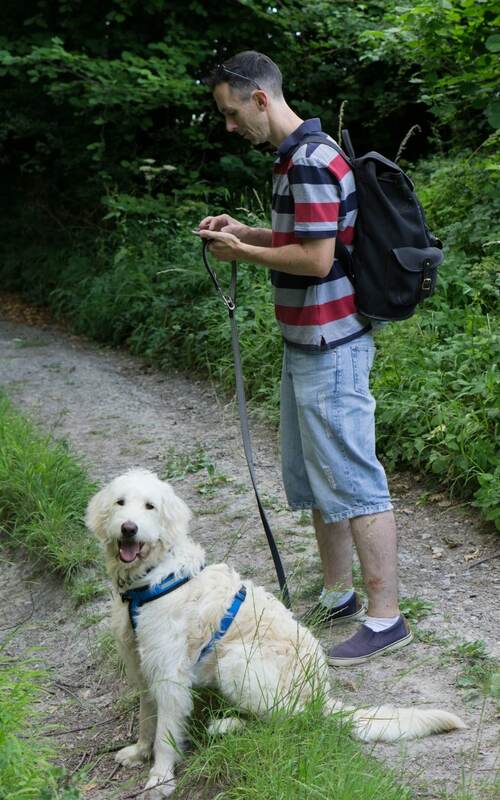 It is good at times to be able to have the option of having Gus on a slightly longer lead but still on lead. Or pulled in on a smaller lead. The Hunter neoprene lead is perfect for what I want, it’s comfy to hold and has 3 options on length. I got this when Gus was a puppy and it is still pretty much in perfect condition. A big part of owning a dog is keeping on top of grooming, Gus is a crossed breed with a poodle but he does moult and quite a bit. 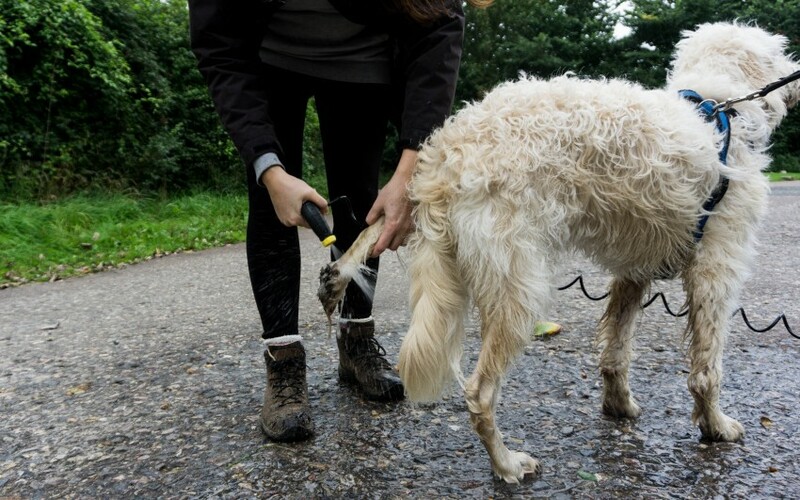 If you have a non moulting dog you will find you really need to keep on top with the grooming. They can matt very easily and the matts pull on the their skin so you must keep on top of it. 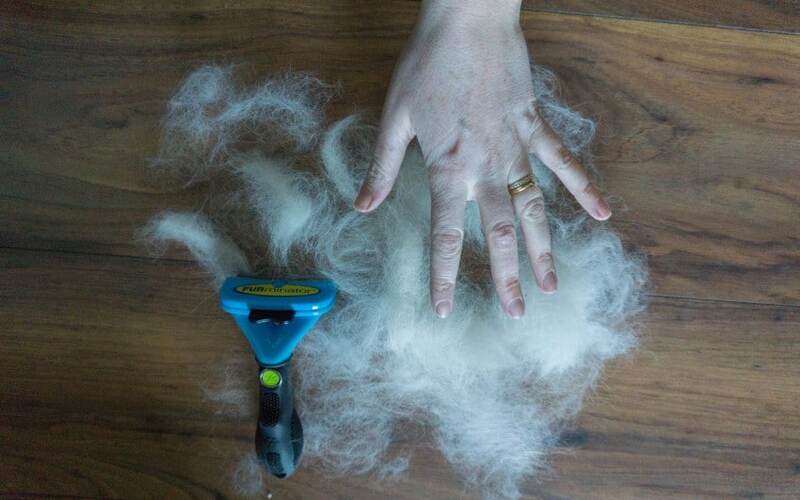 I love using the *FURminator brushes on Gus as they get so much of his fur out of him which means less on my house floor!! Portable Washer – Cleaning Up! I cannot tell you HOW useful this product has been. I love it and I once left it by the side of my car in the car park after using it. I was sure someone had stolen it. I was gutted as it has made such a difference this winter when washing Gus off after his walks. We went back the next day and someone had handed it in! There is some good people in this world. I can guarantee every time someone will ask me in the car park when I use it where I got it from and what a fantastic idea! If I leave this by the side of the car again and someone takes it, I am buying another one! This is a minefield out there! Do your research on what is best for you and your family. We have always crate trained our puppies and when they got to about 8 months old allowed them free run of the house. It’s worked brilliantly for us, kept them safe, giving them a space that is quiet and peaceful to sleep and when I was out allowed them to be happy and not worried. So check the crate for sizing and I also lined mine with vet bed. It comes in a great range of colours and patterns! Quick drying, liquid goes through, non slip underside, thick, soft and so much more! 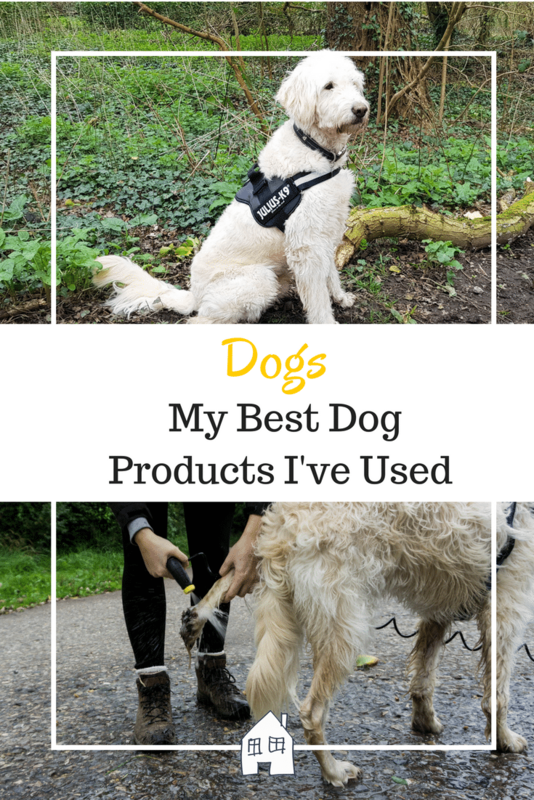 So that’s my round up of all the dog products I love. I hope you have found it useful. They’re all so cute! My mum and dad have recently adopted a dog so I’ll have to pass on your recommendations. We have two very fussy dogs and some of these would be exactly what we need. 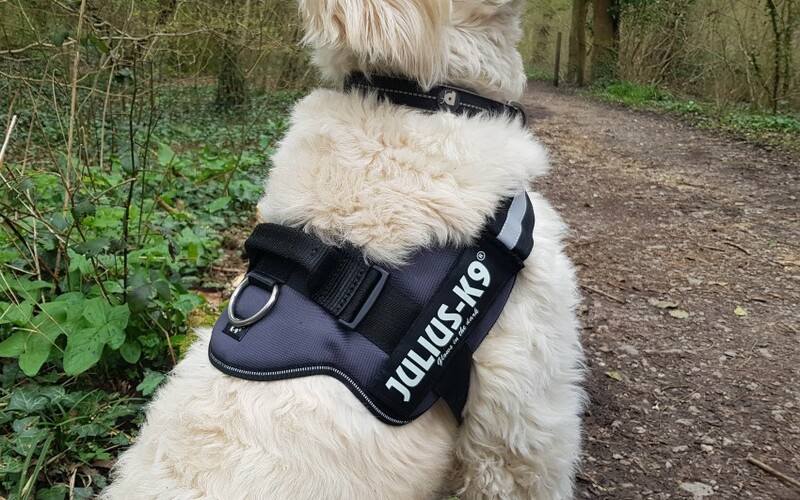 I have seen and heard a lot about the Julius harnesses. I think I may need to invest in a couple of those. Really love this post, mostly because I am dog owner and love our dogs so much. Thank you, glad you like this post. 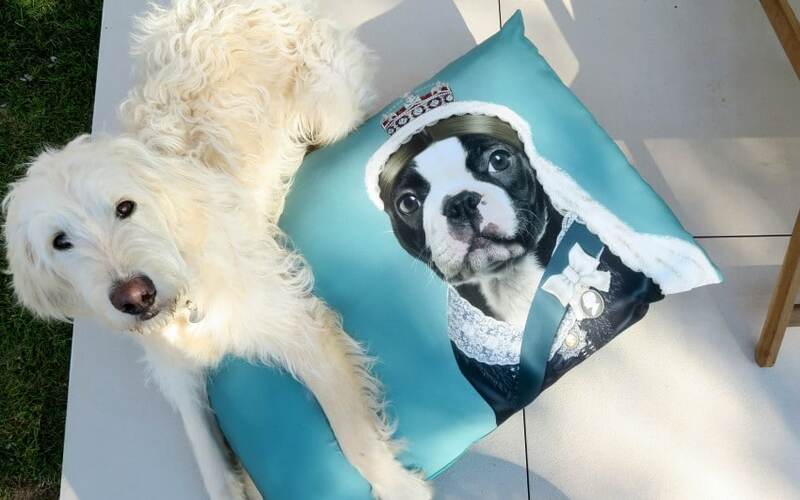 Wahoo to the dog lover! I won’t ever not have one now! 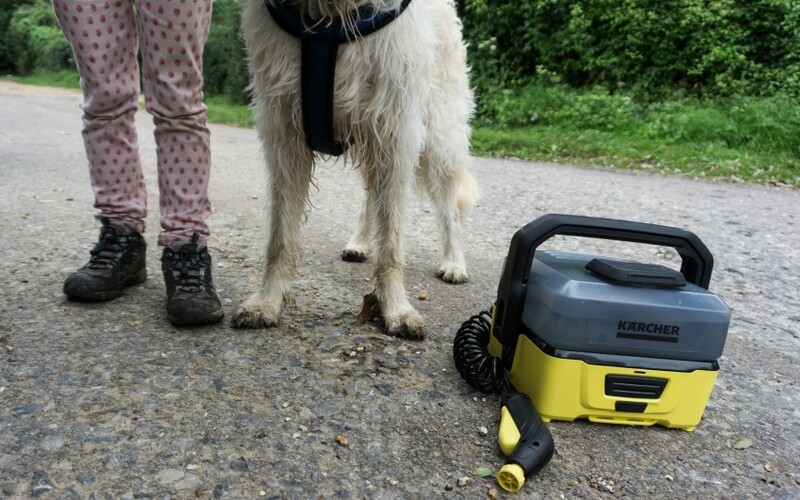 So great for dogs and our muddy boots! Thank you, I love that people have certain animals that they love as its great that they suit each family. My youngest is dog crazy! She’d fill the house with dogs if she had her way. I had no idea there was so much stuff you could get! Haha!! How cute!, so would I! Those puppies are adorable! I had a dog for five years and he was a great dog. He’s still alive but I had to give him to my ex-husband because he wasn’t getting along with the cats and kept snapping at my kids. Turns out he does better in a home without other pets. As long as he’s happy. Oh these all look great! We have a dog but have never tried this brand! I love buying him stuff!!! Great list, especially for anyone considering getting a dog. 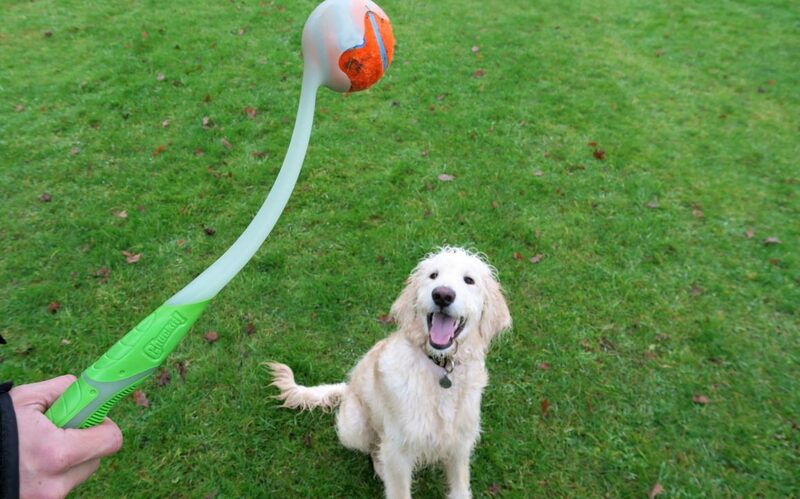 Two of the best things we have for our dog is a Non-stop water bowl and treat pouch and clicker. The bowl reduces the water trail on the floor from the dog and the treat pouch and clicker are handy for keeping up his training. Ah thats interesting about the water bowl, I will have to check that out as Gus dribbles on the floor! I could have seriously done with that portable washer when Jack was around, that would have been amazing. He hated the cold hose bless him as much as the warm shower! When we had our dog he absolutely loved his dog it would keep him amused and bemused for ages trying to work out how to get the treat out! hehe! It keeps them very entertained doesn’t it trying to get the treats out!